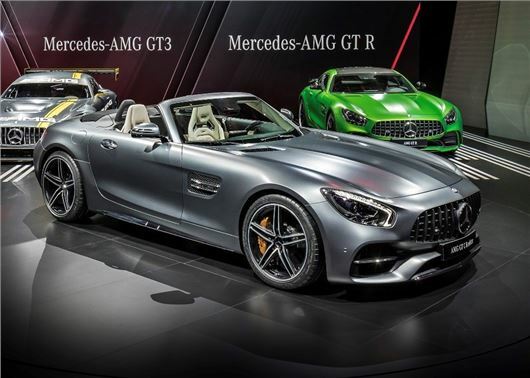 Mercedes-AMG has revealed a convertible version of its GT at the Paris Motor Show. Two versions will be available – a GT Roadster and a GT C Roadster. Both are powered by a twin-turbo V8, producing 476PS and 630Nm of torque in the GT Roadster or 557PS and 680Nm of torque in the GT C Roadster. Prices are expected to start at around £100,000. The triple-layer fabric roof is designed to reduce wind noise while keeping weight down versus a folding metal design. It can be raised or lowered in 11 seconds at speeds up to 31mph. To improve structural rigidity, the AMG GT Roadster features reinforcement in magnesium, steel and aluminium, keeping the centre of gravity low. Acceleration from 0-62mph takes 4.0 seconds in the AMG GT Roadster or 3.7 seconds in the more powerful GT C. Both variants use the same seven-speed dual clutch automatic transmission, though the C has modifications to improve in-gear performance and to give the car a more responsive feel. Top speed for the GT Roadster is 188mph, while the GT C is capable of 196mph. The GT C Roadster has a wider stance, an electronically-controlled limited-slip differential and wider rear tyres versus the GT Roadster. Further changes include a performance exhaust, adaptive dampers and a ‘Race’ setting. Inside, there is new technology in the audio system to improve bass, plus the ‘Airscarf’ system is available, which blows hot air around occupants’ necks to improve comfort with the roof down. For hot days, ventilated seats are available as an option.